Bill Cunningham, one of the most recognizable figures at The New York Times and in all of New York, died Saturday. He was 87. Cunningham was a street life photographer; a cultural anthropologist; a fixture at fashion events; and a celebrity in spite of his desire to keep the camera focused on others, not himself. "My whole thing is to be invisible. You get more natural pictures that way, too," Cunningham wrote in 2002. He summed up his approach this way: "I let the street speak to me." Many readers of the Times loyally flipped open the Styles section every Sunday to see what Cunningham was seeing all around the city. His death, several days after suffering a stroke, was announced by The Times, where he worked for almost four decades. The newspaper's publisher Arthur Sulzberger said in a statement, "We have lost a legend, and I am personally heartbroken to have lost a friend." Cunningham's longtime assistant John Kurdewan posted a tribute on Instagram. He wrote, "William John Cunningham, the genius who created the art form of street photography and had the most singular eye in fashion, died this afternoon from the complications following a stroke." The Times obituary for Cunningham observed that he "used the changing dress habits of the people he photographed to chart the broader shift away from formality and toward something more diffuse and individualistic." Thousands of blogs and Instagram accounts have blossomed in recent years, all of them seeking to document street style in various ways, and many of them owe a debt to Cunningham. Political reporter Trip Gabriel, formerly the Styles section editor, tweeted that Cunningham was the "hardest working journalist I ever knew." Cunningham's signatures included a bicycle, a blue jacket, and a camera around his neck. Manhattanites prized their occasional sightings of Cunningham -- and said he was unfailingly polite and humble. 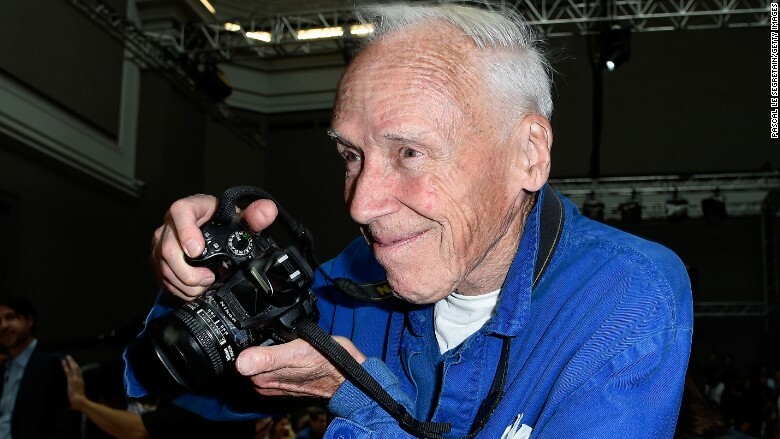 He was the reluctant star of a 2010 documentary about his work, "Bill Cunningham New York." It showed him pedaling from place to place and snapping away, a man and an occupation that seemed to be a perfect match. Alessandra Codinha, the fashion news editor for Vogue.com, tweeted after his death was announced, "RIP Bill Cunningham, a true gentleman and irreplaceable talent. Who will we dress for, now?" "One of the nicest men in fashion," Cosmopolitan editor Joanna Coles tweeted, recalling how he "frequently gave up his seat at a show if you arrived late and he saw you standing." Cunningham's most recent collage was published on June 6. His stroke was reported earlier in the week. Kurdewan updated worried fans through an Instagram post on Thursday. "He is having some health issues that require him to rest and get stronger again," he wrote. "We expect he will be back on his bike and prowling the streets with his camera very soon. In the meantime I will pass along your good wishes." In his tribute on Saturday, Kurdewan wrote, "In these last days as Bill was fighting to recover, I told him of all of your good wishes and expressions of love. There are no words for this loss."